The Mayor of Beaconsfield, one of the wealthiest cities in Canada and a West Island suburb, has announced that a portion of Angell Woods, a large undeveloped tract of old-growth forest between highways 20 and 40, will be developed for residential use. Angell Woods is one of the last remaining large expanses of ‘Montreal wilderness’ and an important wetland, a key component of the West Island’s broader ecosystem. Half is owned by a public consortium of sorts including the cities of Montreal and Beaconsfield as well as the Province of Quebec, while the remaining is in private hands. Mayor Pollock suggested that existing zoning regulations will stipulate high-density residential construction to preserve as much of the forest as possible, but that buying out the owners was impossible simply because no one is willing to front the coin, so to speak. I think it’s fairly evident any residential development in this space will have a deleterious effect on the quality of the forest as a whole, severely undermining what such a large concentrated wetland provides to those living around it. We don’t often think about it, but wetlands play a crucial role in water purification, flood and drought control as well as groundwater replenishment. All of this is of vital concern to every homeowner in Beaconsfield, Baie d’Urfé and Kirkland (at the very least). Consider this: if you ever wondered why Beaconsfield and Baie d’Urfé had such a ‘lush’ quality about them, perhaps you should consider that Angell Woods has been providing considerable, and free, water treatment services for its immediate environs for thousands of years. Destroying half of it may wind up killing the other half, and either way I can anticipate Beaconsfield may suffer some unintended consequences by permitting development in Angell Woods (namely seasonal watering bans, lower general groundwater retention, among other potential environmental changes). For your consideration, an open letter written by one of those land-owners. She makes a compelling argument. These people have paid taxes and the cost of surveys and environmental studies never reimbursed by either the province or cities, they’ve been denied access to their rightfully owned property and further denied the right to develop it. Imagine yourself in their shoes, jerked around by the public sector and prevented from making the fortune you and your family may have worked tirelessly to secure. I suppose it isn’t easy for most of us to imagine ourselves as property developers or land owners, but these people exist and have a right to conduct their business. Unfortunately for them, the simple fact is that we were not thinking strategically about environmental issues and ecological conservation back in the 1950s and 1960s, when most of the properties in Angell Woods were secured by their current owners. Today we’re a little more in tune with the realities of environmental degradation, particularly in urban and semi-urban areas, and so a far broader interest must be considered. Inasmuch as it’s wrong that these property owners (and tax payers) be denied the right to conduct their business, it’s worse for the greater number of people to lose these woods. What’s Beaconsfield without it? The question is not how much it’s worth to the city, but what it’s worth to all the people who live in Beaconsfield and benefit from what I hear is an absolutely splendid little forest? It’s not merely an issue of the public having grown accustomed to walking their dogs on private land they thought was a nature preserve for the last sixty years, it’s that this land is better off – for all of us – if it continues to exist in its natural state. The quality of the air we breathe, the water we drink and the soil we stand on should always be held in higher esteem than any individual’s right to profit. And yet, unless someone comes up with a lot of cash really quick, Montreal will lose another fundamental component of its natural self. Is it time to create West Island transit authority? So I just saw this post from the West Island Gazette concerning the problems commuters can expect what with the commencement of major renovations to the Turcot Interchange next year. Apparently, the MTQ will allow an eastbound lane on highway 20 to be used exclusively by buses, which will certainly be a benefit to West Island commuters. However, there is also a proposal to cut back on one lane on St. John’s Boulevard so that it can be used exclusively for buses; this will no doubt add to the gridlock experienced by West Island motorists on its North-South Axes. The illustration above is a proposed roadway designed to serve as a new North-South axis connecting highways 20 and 40 in addition to Gouin and Pierrefonds boulevards, on the western edge of residential expansion on the West Island. Doubtless, construction of a large suburban boulevard would certainly lead to additional development further West, on effectively what is one of the few large open tracts of raw Montréal wilderness left on island. I can imagine the land between this proposed road and the Anse-a-l’Orme Trail could see a rapid and degenerative transformation within a few years unless certain protective practises were adopted, such as those observed in the United Kingdom with respect to the established green belts. In spite of this danger, this new roadway would at the very least help minimize congestion in the West Island. And if I’m not mistaken, this seems to be the same location for the once proposed highway 40 to highway 440 link, a project which has been dormant since about 1977. See more about that here. This plan would see a major highway built to run from the 40 up along the Timberley Trail, across Ile Bizard (effectively bisecting the island) towards Ile Bigras and then through Laval-des-Rapides to join Highway 440. Now while I’m generally not in favour of new highway construction, if we were to go forward, developing with ecological and economic sustainability in mind, we can built efficient roadways and integrate public transit systems as well. The biggest issue for me is that Montréal is missing key links to create an effective ‘ring-road’ system, and this route could alleviate congestion on highways 40 and 440, not to mention the other North-South axes serving the West Island. With an southern extension, it could intersect with Highway 20 as well, which would be even more efficient. That said, planning highways through residential zones with ecosystems that need to be preserved presents additional complications which need to be taken into consideration. As an example, given the experience with the previous pedestrian crossing at Woodlawn and Highway 20, we know that highway traffic needs to be isolated from residential traffic, and so such a project would necessitate a service road, underpasses and overpasses, not to mention a couple of bridges as well. We also know that building an elevated highway is problematic, and not only because they’re eyesores that can negatively impact land values on either side. Moreover, additional new residential boulevards will be required to help with alleviate congestion on the three current principle arteries. As an example, Jacques-Bizard/ Sommerset should be extended to connect Gouin, de Salaberry, Brunswick and Pierrefonds Blvds with Highway 40 while Antoine-Faucon should be developed into a boulevard in its own right, to connect with the Anse-a-l’Orme trail. Planning with this in mind would be made easier if the West Island communities consolidated their efforts into a single collaborative transit and transportation authority designed to administer road and highway development, public transit and transportation infrastructure. Imagine a West Island version of the STM, STL or RTL, with the added responsibilities of planning and executing the construction of new roadways (with public transit in mind). West Islanders need to plan for roadway construction with new development in mind, but this shouldn’t preclude us from integrating ecologically sustainable public transit systems into our new roadways. No matter which way you cut it, we need to be masters of our domain, and can no longer depend on others to solve our planning and transit problems. A West Island transit authority could do just this. Depending on how you define the West Island, it’s population ranges from 225 to 300 thousand people and there is plenty of room to grow. 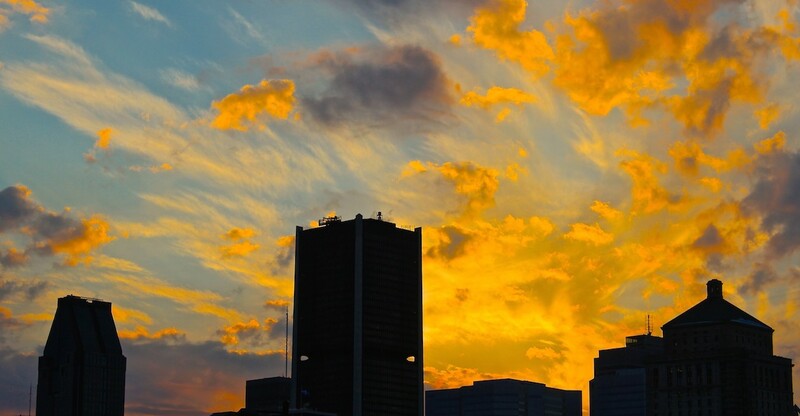 It’s largely flat with long, wide boulevards and streets and there is a considerable amount of daily internal movement, making public transit a necessity both within West Island and between the West Island and the City of Montréal. Furthermore, West Island residents commute in large numbers; the two most used AMT commuter train lines both serve the West Island. Despite the generally good public transit coverage offered by the AMT and STM, many West Island residents feel public transit options are limited and roadways are as overly congested as the express buses and trains running between the city and suburbs. With all the new highway work projected over the next few years, residents have a pressing reason to unite and begin developing sources of revenue to build new roads, highways and public transit alternatives. Simply put we need our own lobby and leverage group, and taking on this responsibility will, at the very least, allow us to develop a system appropriate to our own needs. A) West Island residents have a legitimate reason to ask for a Métro connection to the West Island, ideally to Fairview along the Highway 40 corridor. Whether this comes to be as a new line or an extension to an existing line (such as the Blue Line, which could pass through Airport on the way to St. John’s Blvd), we have a large enough population to make good use of it, and this in turn would cut down on commuters using their cars or the multiple existing express bus lines. That said, unless the West Island municipalities are willing to develop a significant portion of the construction capital by themselves, the STM will have to focus on its chief customers; that is to say, the residents of the City of Montréal. A unified West Island transit authority would be in a better position to administer such a large project, and the transfer of public transit responsibilities to the new body may in turn liberate additional funds from the STM to help in the development of a new Métro line. But we need to be able to stand on our own two feet. B) The West Island’s geography and urban planning have produced a large area defined by its flat topography and wide streets – ideally suited for a large surface tram or trolleybus network. 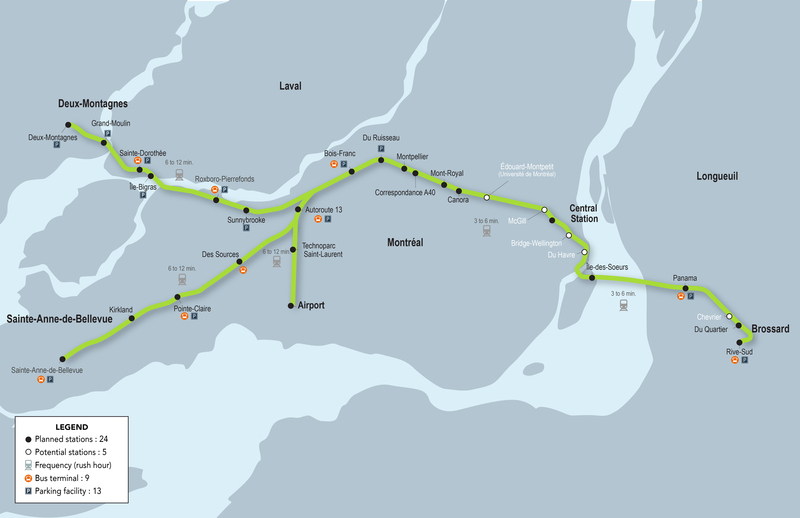 Two dozen lines could cover all the principle North-South & East-West axes, in addition to express lines running along the highway service roads and a ring-route using Lakeshore, Beaconsfield, Senneville, Gouin and des Sources boulevards. Such a system would mean the STM and AMT could move away from using express buses given that the trams would connect to major transit junctions, such as the Dorval Circle area, Cote-Vertu Métro station, Bois-Franc station etc. The STM could then re-focus its West Island operations away from the major thoroughfares and instead better serve the vast expanses of suburbia. Trams have the advantage of carrying more passengers than regular buses and are quieter, more efficient and could more effectively shuttle West Island commuters into the higher capacity systems, such as the Métro and AMT commuter trains. Either way – just like Laval and Longueuil, the West Island has particular transit and transportation needs, and we should form a collaborative organization to support the sound development of a better local system. We should do this not out of frustration but because we need to take responsibility for our own development, and such a large enterprise gives us real economic power, not to mention potential political leverage. We should do this ultimately to help empower ourselves, and potentially improve public transit throughout the region as a result of our inspired leadership. This is something that we can accomplish and it would be a great credit to our community. We’re only going to get bigger, so we can’t rely on outside agencies and land speculators to dictate development any more. The West Island needs to recognize it is a viable community now, with a history and a culture all its own. We aren’t merely a local Levittown, a random collection of houses built according to market directives, and so we need to start thinking bigger, and thinking more precisely about what we can achieve and build for ourselves, together. We may be inclined at some point in the future to unite the independent communities of the West Island into a single urban agglomeration to best represent our needs and desires on a larger scale. Frankly, I think it’s inevitable that this will happen. Building our own transit agency is a good stepping stone to realizing this goal, not to mention a strong foundation on which to base it. And if we were to embark on such a plan, there’s no doubt in mind we can conspire to make public transit the preferred method of getting around the West Island and for commuting into the city. It would help stimulate our economy and ultimately lead to better living and healthier lifestyles. These are but a few reasons, I’ll elucidate the rest later on. So I just moved back into the city and am looking forward to a summer living in the downtown. Yes, Pierrefonds is technically speaking part of the City of Montréal, but in too many respects it is a world away from the urban environment I really identify with. I was raised in Pierrefonds, and can honestly say it’s an excellent place to raise a family, but for a young boulevardier it has recently begun to make its comparative isolation apparent. Regardless, the plan was to move out once the degree was complete, after several earlier attempts to make it on my own and three summers in a row living out of a suitcase in Toronto, I’m now finally in a position to get back home, to the city. That being said, I do have an affinity for my hometown, as most people do. Pierrefonds in the summer is a really lovely place. I could spend hours lying in the sun in my backyard, listening to the symphony of local birds and small rodents going through their version of the daily grind. The soil’s decent enough for the most part, and people diligently tend to their lawns and gardens. It’s a very green part of the city, lush even by typically verdant Montreal standards. There are parks and other green spaces strategically located throughout, and the community has access to the back river, though there unfortunately no beaches, and few riverside parks. The houses are very similar throughout the central portion of Pierrefonds, where I grew up, having been built in the early 1960s. They’re all middle-class, medium-sized bungalows based on about a dozen variations of a similar design, and have been placed on roughly equal half-acre plots. From the size of some of the trees in the neighbourhood, it would seem as if the contractors and developers tried to keep as many of the older ones as possible, ergo – Pierrefonds and part of DDO was not initially the victim of slash-and-burn residential development. By contrast, it’s difficult to tell where the farm boundaries used to be – they’re not completely obvious, though ancient farmhouses and beach-houses can still be seen along Gouin Boulevard. The Western tip of the Island, including parts of Pierrefonds, Senneville and St-Anne-de-Bellevue is still comparatively undeveloped. I remember a few years back working for a landscaping and construction company, driving along Chemin Ste-Marie we spotted a group of deer drinking from a swamp. A few months back, a grey fox stopped just long enough in front of my house to give me a rather inquisitive look, as though he was startled to see me! Rabbits run amok at night in Pierrefonds, darting out of nowhere to startle the stoned pedestrian. There are cranes, falcons, skunks, porcupines, beaver, raccoons, groundhogs, chipmunks and the occasional wolverine in these parts, and though this may seem to be obvious given the type of climate and ecosystem we find ourselves in, I still find it somewhat incredible that we haven’t already eradicated these species through residential encroachment. If we believe that it’s somewhat important to maintain a wild side to Montreal Island, then I think its about time we get serious about protecting the last remaining wild spaces on the island. If you compare the western tip with the eastern tip of the island, you’ll notice that there’s considerably more space worth protecting out West (there seem to be a lot of golf courses out East). There’s an organization called Coop du Grand Orme which has been involved in trying to protect West Island green spaces, including the beautiful Angel Woods in Beaconsfield. This here is the latest news I could find on efforts to protect the Anse-a-l’Orme area in Pierrefonds/Kirkland. Long story short; the West Island used to be pretty rustic, rural and green. I think much more ought to be done to protect these extremely valuable spaces. That being said, as long as the West Island communities remain separate from the City, it may make things more difficult to devise master plans to protect and promote our last remaining large nature areas. The Island of Montreal is ten times larger than the Island of Manhattan, and yet we haven’t even remotely come close to achieving their level of urban density. Food for thought. If these spaces were more thoroughly protected, and the City sought to develop some of these areas for recreational purposes, we may be able to stimulate on-island camping, riverside resorts etc. There’s a lot of money to be made by carefully protecting green spaces. As my brother remarked about a week ago on the 205 heading home to visit my mom, once the land is developed, the process can’t be reversed. He said this as we passed land being clear-cut for new McMansions. Just down the road from my childhood home, a lot which had been open and undeveloped for as long as I can remember now features a featureless building with no tenant. Build it and they will come? Doesn’t look like it.